Unlike some websites, we do not share cookie information with other websites or other parties. We have a Privacy Notice for compliance with EU GDPR. To view this statement please click here. If you did not find your confirmation email in your inbox, it is possible that your email application has put it in another folder. Some email applications put emails in 'Junk' / 'Spam' or 'Bulk' folders if they do not recognise the sender; this normally happens when the email application has a poor email filtering. 1) Firstly double check any other folders that your email application uses to save incoming emails such as 'Inbox' / 'Junk' / 'Spam' / 'Bulk' / 'Trash' etc. to check you have not just missed it. Gmail is known to be a problem and will often put confirmation emails incorrectly into the 'Spam' folder. If you are using a Gmail account and your 'Spam' folder is not displayed try clicking on 'More' in the list under the 'Compose' button, then clicking on 'Spam'. If you still cannot find your confirmation email you can have it resent using the following procedure. 2) Log in here. As you have not received your confirmation email that will have included your password, enter the email address you used to register and click on 'Email me my password'. Please correct the following inputs and resubmit. The email address / username provided has not been found. Please check it is entered correctly and try again. Either you used a different email address (or mis-typed your email address) when you registered. If you used a different email address to register please check the inbox etc. for that. If you may have made a typing error please use the contact us form and include your email address, the url (website) you registered and the date when you registered. We will then be able to correct your registration. 3) Assuming your email address was registered, you will receive an email with a new password. Again if your email application did not put your email in your inbox within a few minutes, please check any other folders your email application could have sent it to. 4) After receiving your new password Click here to log in. After logging in the site will check any registrations and email you a new confirmation email for your site(s). 5) Open your email application and check your inbox (and any other folders your email application could have sent it to) for your new confirmation email. Follow the instructions in the email to confirm your registration and activate your traffic. If you are not currently logged in hover over 'Your Area' and click on 'Log in' and log in. Hover over 'Your area' and click on 'Settings'. Select the site you wish to update or promote. If you have registered multiple websites and the one you wish to edit is not displayed; select the site you wish to edit and click on the Change site button, which will refresh the page and display the information relating to the selected site. Edit the website related information under the Edit your website information heading and then click on the Update site button. If you experience problems posting your self-promoting link onto Facebook using the buttons on this website we suggest that you do it manually as follows. Where the #### is your personal self-promoting link id as provided on your Settings page or where the hhhh is your personal self-promoting link in hex format. Promote your business / personal website here for free. and press enter/return twice to create a blank line. Then copy one of your self-promoting link and press enter/return again. You should have something like the following. The #### being your self-promoting id. Note, sometimes Facebook will display one of the images from the website after you enter your link. Ensure that Public is selected and then click on Post which should create a post something like the following, depending if you use your normal or video self-promoting link. Note how Facebook sizes and crops the image may vary from that shown. We have created a number of lessons that will help you get started with sharing and building your online business. To view / review your lessons visit your settings page and select the lesson you would like to view / review. As each lesson is tailored to a specific registration, you should select the registration (website) that you want to drive to as explained on your settings page. Additional lessons are only available when you have confirmed that you have completed the previous lesson. With affiliate marketing you receive a commission when you help market other peoples products or services. In general the percentage you receive is in the order or 40 to 80 percent of the sales price. In some cases you will receive not only a percentage of the initial sale also a commission on any additionl sales (including up sells) and ongoing sales (typically monthly subscriptions). There is a huge range of products and services that you can market. One advantage of being an affiliate is that in general you do not need to buy stock, store, ship, handle refunds or handle customer queries. In many cases affiliate products are provided as digital downloads. The easiest way to sell advertising space is to register with somewhere like Google or Amazon, and display their marketing material on your website. You will then receive money based on either the number of advert views or the number of clicks or somtimes a percentage of the order value. The PPV (Pay per view) rates are typically very low so unless you have a huge amount of traffic you will not receive much from PPV. PPC / PPA (Pay per click / action) pays a higher rate for each click but as the number of clicks is only generally a few percent of the views, the net effect is that the income will be relatively low unless you have a huge amount of traffic. Another option is to display private advertising. While you can expect to get a bit more you still need to be competitive so the income will again be limited. Unlike using Google or Amazon advertising you need to set up your website to manage the views or clicks, which is why this is not normally a viable option for must website owners. To sell leads you need to find someone who is willing to buy your leads which often need to be targeted. If you have a website related to the target niche you may be able to just direct visitors to your lead buyer or you can advertise to find suitable leads and for them. Some businesses are prepared to pay a reasonable amount for leads. There are various ways to make money from your opionions. You can complete surveys, give your opinions on social sites, review products etc. This option is more like a regular job where you simply get paid for the work you do. A great benefit is that you do not need any money to start all you do is to register and complete the tasks provided. To get started click here or on the image below for more information. In general selling your own products and affiliate marketing are the higher earners (I think it is true to say that there are more millionaires created using these options than any other). Selling advertising space and leads are typically relatively low earners in comparison unless you have a huge amount of traffic. Focusing on high earners is obviously the best plan to generate a reasonable income but you can use a mixture if you wish. In addition to just making money you need to consider what you would enjoy doing and your commitment. More people fail by not following a system that works. If you have your own products or services to market then it would make sense for this to be part of your Internet Business plan if they are suitable for Internet marketing. Even if you market your own products/services adding some affiliate marketing normally has major advantages as it increases the number of your income streams (sources/places paying you). As most people who are looking to earn an income on the Internet do NOT have their own products/services ready to market, affiliate marketing is the quickest and easiest way to generate a reasonable income. An alternative is to get paid for your opinions click here for more information on getting paid for your opinions. What do you need to start, affiliate marketing? A conversion process to convert visitors into buyers. Order processing to accept payments. You also need to have an account to receive your payments, in most cases this could be an online bank like Paypal.com where you can set up a free account or your own bank if being paid by cheque. There are thousands of products you can select to market. ClickBank.com is one of the largest sites where you can find some 30,000 products, but there are a number of other sites with affiliate products you can market. The problem is not finding a product you could market but selecting a good product from all of the options available. Is it a goog quality (value for money) product. Why do so many people fail at Internet Marketing? 1) Lack of effort like any business you need to take it seriously and put the effort in to make it work. 2) Failing to follow / implement a plan. It is better to copy a plan that works. 3) Giving up too early. Failure is easy, success requires effort but the rewards can be huge. 4) Little or no advertising. Like any business you need to advertise / market. 5) Advertising in the wrong place. You need to advertise where your potential customers go. 6) Using advertising that is not cost effective. Any advertising needs to generate a positive benefit. 7) Picking the wrong products to market. 8) Using poor marketing material If the advertising material provided is not working you could make your own if the product warrents it. 9) Marketing a product that does not have a good conversion rate. 10) Marketing a product that has a high return rate. 11) Not following up with potential customers. 12) Not running your business efficently. 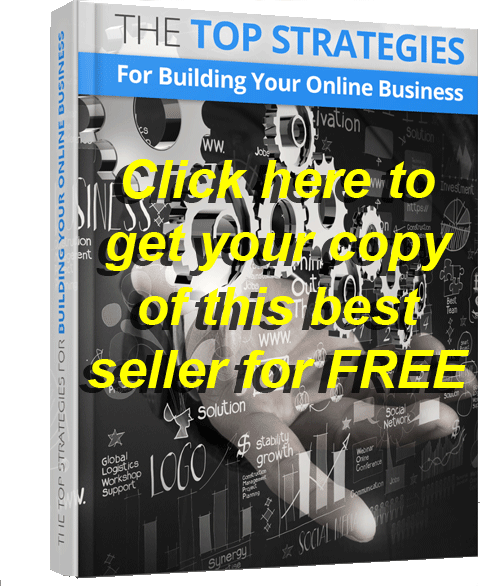 You need to use methods that will increase your profits. 13) Not using a contact list. 14) Lack of focus. Changing from one internet marketing plan to another without getting anything to work. So what is are the most common reasons for failure, that is simple numbers 1,2 and 3 above. They are all under your control. If you follow a plan that works all the other items will already have been tried and tested, you just need to follow the instructions. If you want to generate an additional income stream either to suplement your current income or as a main source of income you need to put in the effort to make it work. It is strange that some people will go to work 5 or more days a week; work their buts off for little return but given the opportunity to earn potentially more than a paid job they expect have money flowing in without doing anything. If you listen to any of the honest experts they will tell you that they had to work to acheive their results. They will tell you that it took effort and trial and error. The advantage you now have is that some of them will share what they have learnt so you can get started quickly and easily; just by following a tried and tested plan. Failing to follow a plan. We all know the wheel has been invented. Internet marketing has also been invented/created. While the wheel may be modified for a particular application fundamentally it is still round and rotates around it's center. Internet marketing is very similar it may need to be modified a bit but the basic principals remain the same. By way of an example let is look at a Bricks and Mortar business that has spread globally. Anyone buying a franchise in this business is given a business plan. This includes everything they need to succeed. In this case like many other franchises they are not just given a plan it is part of the franchise contract that has to be followed. Even the decor is prescribed so it is recognised globally, the products sold are also controlled. If the owner was not to follow the plan, and thought by leaving out the meat in the hamburgers that 20c per burger could be saved, what would happen? They would get a lot of complaints, very unhappy customers and would go out of business. Why, they were not following the plan that works. If you DO NOT FOLLOW a viable plan you are doomed to failure. Like any business you will need to set it up before you can expect to earn anything. The quicker you get it set up, the quicker you can start to make a profit. As you can see above you need to know how to select suitable products (ones that will sell well and make you a reasonable profit), you also need to know where to market them cost effectively. All the experts will tell you the money is in the list. What this means is that you should create a contact list of every one who registers an interest in your products. It is possible that they may not buy when they first see your marketing material and sending them some additional information after a short period may convert them into a customer. You can also suggest other products that they may be interested in. You could send then a regular newsletter that could contain usefull information. You can automate building a contact list so that it is automatically created from your marketing material. It can send out automated follow ups and you can send out newsletters. You need to ensure you comply with the law and include an unsubscribe facility so that people can be removed from your list. It is best if they can do this themselves automatically as this avoids a possible headache for you. There are a number of companies who can manage this all for you. While you can run an Internet business without your own website there are a number of benefits of having your own and I do recommend you have one that you can update. There are even some that you can get preloaded with affiliate products ready to go for free (you do however need to buy hosting and a website name). This is a very important issue. Having only one product to sell is not a good long term plan. While you can start with one income stream if you want to have a more reliable (on going) income it is best to offer a number of products; generating multiple income streams (do not have all your eggs in one basket). Can you imagine if all shops (even super stores) where to just stock one product. What would it do to their sales figures? Shops know that they need to offer a range of products. If a shop only sold one type of bread; firstly they would not get many people through the door (shoppers like a choice, they want different things, they have personal preferences) and secondly the value of each customer would be very low. Most businesses would go out of business very quickly if they offered just one product. On the Internet it is possible to market just one item but there are still significant benefits in marketing multiple products. When starting out, there are benefits of starting in a particular niche and developing a range of offerings around this niche. This will help you to generate more income from your marketing. If you view a product on Amazon you will see they provide additional items that are linked to it (Buyers of this item also bought these items) or package deals. As your business grows you can look a more diverse range of offerings (like the super stores). Just like a shop you will need to look at changing your offerings over time. Like any business your business will be affected by changing trends, the release of new products and products that are discontinued. Advertising and marketing costs and methods will also effect the viability of marketing a particular product. YES, there are short cuts you can use that will do all the hard work for you and avoid the often painful learning curve if you try to do it yourself. Using a short cut to success is ideal for both newbies and anyone who wants to get started quickly, or has either failed before or wants use a working plan. The short cut below is a working plan that others are using to make money online so you stand a very good chance of success if you follow the advise provided (the plan). These short cuts do require a small financial investment for hosting and setting up the income streams but it is well worth it if it gets you started earning a good online income. There are start up costs and running costs with any business and some effort is required especially to start. Once you are up and running making a profit you only need to follow a maintenance plan that will keep your business going. One key advantage of being an Internet Marketer is that the amount of time required to maintain your business is relatively low in comparison to 9 to 5 jobs and the rewards can be high. One of the key issues is to use a plan that is known to work and stick with it. Do not re-invent the wheel or try your own short cuts like taking out the "meat out of the hamburger". Stick to what is known to work. The following short cut will take you through all the steps you require to get started. This short cut system will lead you through setting up six income streams that are known to generate a good income, create a free marketing website for you (you do however need to pay for the name and website hosting which is not much), set up your own list builder, set up your own preloaded autoresponder, provide you with the marketing material you need, show you how to easily find customers and much more. As everything is under your control you can even add new products (income streams) if you wish at any time. Yes, you can try to select your own selection of good products to market, find suitable places to advertise your selected products, work out how to set up and build your own contact list, set up your own autoresponder etc. etc. The problem in doing everything yourself is that you will not have a proven plan to follow. The vast majority of people who try to do everything to themselves do not make it. This is not to say it cannot be done, just that this is not as easy as it sounds; the learing curve can be painfull, slow and expensive. Like most things the devil is in the detail and unless you have a full understanding of Internet marketing you are liable to fail as the odds are stacked against you. If you are starting out or need a plan that works, start with a plan that is known to work and build up from there. The link to your site is automatically created when you register your website, however it does not become active until have confirmed your registration and confirmed that your website is displayed on your website landing page or if you have selected to use a button or image link to your website, confirmed it is working. Note 1), if you did not enter a website when you registered you can add it on your Settings page. Note 2) you can edit or change the registered website at any time on your Settings page. You will want to change the registered website link if you are promoting an affiliate offer that has been discontinued and / or you want to change to a different affiliate offer or website. Note 3, you can check the current display status of your website(s) at any time by visiting your Settings page.Note 4, if you have not confirmed your website display status see the following section Checking and setting the display status of your website. After you have registered a new website or changed the registered website you need to confirm that it is displayed correctly on your website landing page. You are automatically guided through the confirmation step when you register a new website however if you need to complete this step for any reason this is the recommended process. Step 1) If you are not automatically taken to the following section (Your registered website summary and stats), you can jump to it by selecting the Your registered website summary and stats in the menu index at the top of your Settings page. or scrolling down to it. Step 2) Check the status of your registered website(s). If the status column shown shows OK your website has been confirmed and no action is required. If the status message shown is Verification required click on the status message and follow the instructions to confirm the display status of your website. For any othe status messages, hover over the More... (Status notes) for more details of actions required. If you have registered more than one website and the website you wish to confirm is not corrently selected. Select the website in the Current website form and click on the Change button. 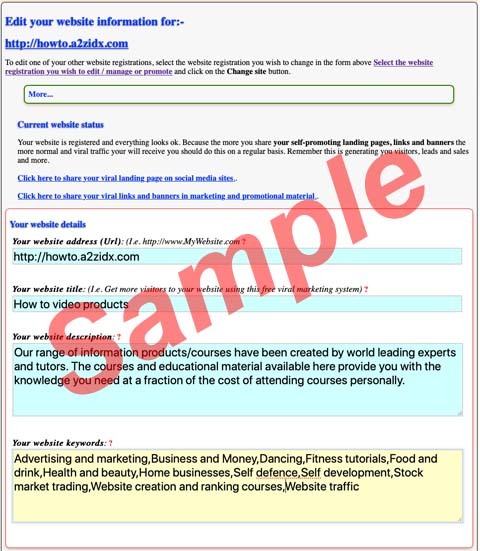 Note, this form is only displayed if you have registered more than one website. In the Your website display status field select the correct display status for your website. If it is correctly displayed below the form select Your website is displayed below. If it is not displayed either there is a problem with website address provided or there is a problem with the website or the website does not support embedding. Note 1), breaking out of the display frame is not allowed and will prevent you from confirming the website display status. The work around for this if you cannot change the web page coding is to create a seperate page that is in compliance with this websites terms and conditions. Screen shot of the select your website display status. After selecting the required status click on the Update button. Simply copy one of your self-promoting viral links into your browser´s address bar and either press Enter on your keyboard or click / tap on the search icon. Note, if you are logged in your additional share information will be displayed. You can hide this additional share information by clicking on the link to hide it or log out and then visit / refresh the page which will display only the normal visitor part of the page. To show the additional share information, log in and then use one of your self-promoting viral links. followed by your you website link. If you click in the link it should open your website if the URL is correct. This is the website the system will be displaying / directing visitors to. Note, if a link to your website is not displayed under The following site helped to bring you this opportunity you may have set up some traffic filtering (so the website will only be displayed a proportion of the time) or if it is only to be displayed to visitors from a specific country (and you are not in the selected country) or you have not set the display status for the website or for some other reason the website is not currently available; please visit your settings page to make any changes to your settings. Remember to share your self promoting links in as many places as possible to build your traffic. You can manage your traffic (from 0 to 100 percent) at any time in your Settings page. The traffic management is automatic and any changes you make are done as soon as you submit the change. If you reduce or stop your viral traffic, any unused traffic will be passed up one level so that it does not affect the visitor registration experience. You can use this feature to provide split testing on two websites / website pages or profit sharing if you wish when you have registered multiple websites (url´s). The instructions provided on this site assume that you have not reduced or stopped your traffic. In addition to reducing the percentage of traffic you can also use location filters (country or geographical location) to target visitors from specific areas. In addition to using the traffic management to reduce the amount of traffic that is sent to your website you can also use it to do split testing and profit sharing. To do this, simply register two different websites and then set the traffic control on the first site to the percentage split you want between the two sites (0 to 100 percent), say 50 percent on your Settings page. Any traffic not handled by the first website is passed up to the next website. 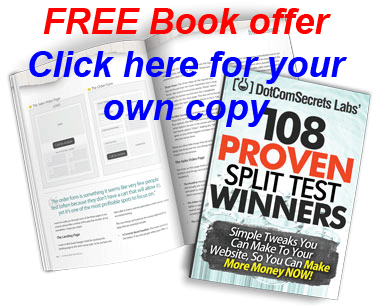 If you are doing a split testing between two websites once you have decided on a winner you can change the traffic control so that all of the traffic is directed to the best option. If the first website is the winner you can set the traffic to 100 percent so that all the traffic will be handled by the first website. If the second website is the winner you can set the traffic on the first website to 0 percent so that all the traffic will be passed to the second website. Note 1) While we suggest that you only share the self-promoting link for the first website; if you have shared the self-promoting links for both sites you need to uncheck the Start of new set for the second website to ensure that all the traffic is shared according to the split percentage set. Note 2) If you are doing split testing or profit sharing with any location filtering, you should ensure that the location filtering is the same for both websites to ensure that the split is not affected by other filtering. Note 3) The traffic percentage for the second website should be set to 100 percent. Set the traffic percentage to the split percentage required. Check the Start of new set. Set the traffic percentage to 100 percent. Uncheck the Start of new set. If any location filtering is used on the first website you should set the location filtering on the second website so that they are identical. 1) Register each site and share the self-promoting links for each site. 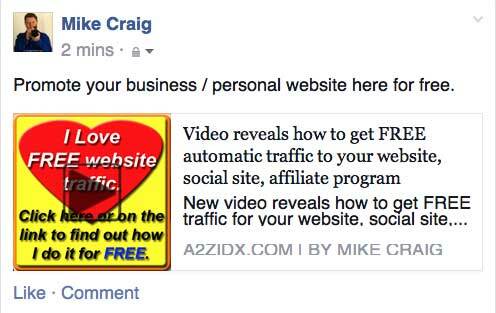 2) Create a single web page that includes links to all the websites you wish to send traffic to. Register the web page and share the self-promoting link for the registered web page. Here are some of the main reasons why registering your websites seperatly may be the better option. a) You can automatically control the display a specific website based on the visitors geographical location. b) You can automatically control the display a specific website based on the visitors country. c) You can automatically do split testing / profit sharing. d) You can provide different offers to your self-promoting link visitors and other viral visitors. e) You can change the website displayed at any time for any self-promoting viral link. So if, for example you are promoting an affiliate link that is discontinued or you have a better offer, you can redirect your traffic to a new offer in seconds. f) You can exchange and reorder your registrations at any time. g) You do not need to create a seperate web page / website to combine your offers. h) You can manage the percentage of traffic to any website from 0 to 100 percent at any time. You can obviously use your own combination of these methods. If you have multiple websites registered you need to share the unique self-promoting links for each website. Each registered website generates it´s own downline and viral traffic; so if one of your websites is not receiving as much traffic as you would like simply increase the amount you share the self-promoting links relating to the website you want to get more traffic. Remember, The more you share the more you will receive. Note, if you have multiple websites registered but your best website / offer does not have the biggest downline (amount of traffic /visitors) you can exchange the websites in your Settings: so that your best website is assigned to the registration with the largest amount of traffic. We find that normally if your website is not displayed on your website landing page it is because the website address is not correct, possibly because there was a typing error or the complete website address (Url) was not provided; in which case simply visit your Settings and correct the website address (Url) provided. While we have now added some additional coding to verify each website addresses (Urls) provided is valid and help correct some common errors we cannot correct all typing errors and request the person doing the registration checks that the website is displayed correctly on their website landing page or the link to their website works if not using embedding. 1) Ask your website designer to remove the embedding limitation on your website for this site, so that it will embed it normally (this is the best option and recommended where you can easily remove the embedding block). Note, this option is not normally an option if the site is provided by a large corporate business or a social website that does not support embedding. 2) Make a clone of the web page you want visitors to see on a website that can be embedded. While you can normally copy and paste the source code of a website page you want to clone into a new page on a different website, often some additional changes will be required to the on page links and to remove any coding that prevents embedding. There are some places where you can find people who can help you do this for you at a reasonable price. Visit your Settings page and scroll down to the section headed Edit your website information for:-. With the website that cannot be embedded shown under the heading, uncheck Embed your website option and click on the Update site button. This will replace your website display area with an image your visitors can click on to view your website in a new window. This option is not as user friendly as they need to click on the the image (which they may not do) to view your website. We suggest that you only use this option until you can implement one of the recommended options above. Note, you can also provide your own image that will be used in place of the default image. Providing your own image is recommended if you cannot do any of the options above (I.e cannot embed your website or use an alternative web page). You can add a link to the image you want to use in the Custom image link (Url) field. If you have a website address that is either very long or includes special characters you can use a URL shortener to get a short URL that only uses normal characters. Click here for the Google URL shortener or Click here for URL shorteners from other companies. After getting a shortened version of your website address (Url) paste it into the Website address (Url) field in your Settings page. If you want to build a list using the self-promoting viral traffic generator, simply register your list registration page so that your visitors can directly join your list when your embedded web page (your websites landing page) is displayed. Normally every registration you create works fully independently. So if the self-promoting link a visitor uses, links to a registration without any filtering the linked website is displayed. By default if a registration includes any filtering and the visitor does not match the filter the next registration above will be checked. If you create a number of registrations some with filtering, you may want them to act as a set. If you create, let us say five registrations ordered as follows, one that provides an offer for local visitors, then an offer for visitors from the USA, then an offer for CANADIAN visitors and then an offer for UK visitors and finally an offer for the rest of the world (ALL COUNTRIES) as shown below. Anyone using the self-promoting link to the first registration in the set (your local business offer) will be checked to find out if they are inside the local area for this offer (based on the latitude, longitude and range you set and the visitors determined location). If they are inside the offer area then this will be displayed otherwise the next option (follow the blue arrow) will be checked (the USA offer in our example) which will be displayed if they are in the USA. If they not from the USA the next option will be checked (the CANADIAN offer). If they are NOT from CANADA they will be passed up to the next offer etc. If no match previous match is found the rest of the world offer will be displayed. If these five registrations are NOT set up as part of a set (i.e. the dafault) and a visitor uses the self-promoting link to the UK registration (for example) then the visitor will be passed up if they are not from the UK to the rest of the world offer (so they will not be checked against the previous options (The local offer, The USA offer or the CANADA offer in our example)). Obviously, if you only shared the self-promoting link to the first registration (The local offer in our example) every visitor would start at the first offer. To ensure any visitor is filtered through all the registrations, you can make the five registrations (in our example) as a set by un-checking the Start of a new set for all but the first item, this will mean that any visitor will be checked against the first item in the set first (The local offer in our example) even if the self-promoting link was directed at the offer for all countries. When you share your self-promoting links anywhere (in adverts, on social media sites, in forums, your emails, blogs etc.) the landing page displayed will be depend on the link option you used. 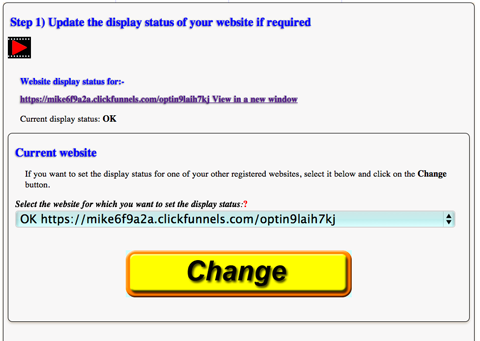 You can however change the viral landing page displayed to your visitor in your Settings page. In the original version of this software there were only two viral landing pages automatically created for each registration (the viral registration landing page and the viral video landing page). In version 2.0 of this software we added an additional viral landing page, the viral website landing page. This new viral website landing page was seen as a major benefit to a lot of our subscribers as it embedded the registered website and included a self-promoting viral link on the same page automatically. Prior to this, to get the same functionality a user would need to add a banner to their website, that some users either could not do or would have needed to get this done for them that would enevitably have cost them some money. Appreciating that in some cases our existing registered users would like to send visitors to the new viral website landing page that embeds their website, in place of them going to one or both of the previously available options; we built in a feature that would enable anyone with a link to one of the previous landing pages to have it direct visitors to the new landing page if they wished. This meant that users did not need to make any editing changes the self-promoting links that they had already set up if they wanted them to be directed to the new landing page. 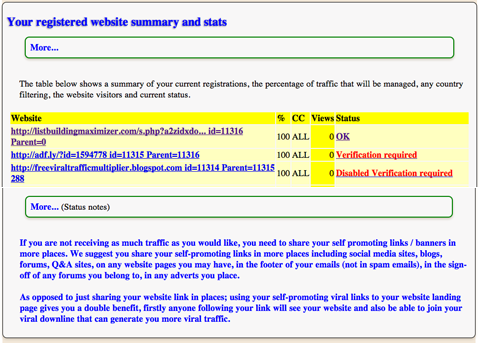 We have now built the ability for all our users to control the redirection of traffic to their viral landing pages. We suggest that you check all of these unless you do not want to use a particular landing page option. If anyone clicks on a self-promoting link that links to a landing page option that is not checked, the visitor will be directed to the landing page selected in Your default landing page. You can also do a search for other picture resizing sites. If you have more than one website you can cross promote them by adding a banner for website 2 on website 1 and then adding a banner for website 1 on website 2. When you do this and they visit website 1 and click on the viral banner for website 2 to register their website then will need to visit your website 2. So now So now they have seen both of your websites. By default every website registration you create has it´s own set of viral self-promoting links / banners that generate traffic to that specific website, however you can use a number of different filters, such as location based, traffic management and if the visitor used one of your self-promoting links or is a FREE viral visitor. Why use different offers to your self-promoting link visitors and other viral visitors? If your website and the marketing you use to promote your website is in a narrow niche field (say knitting or a local business such as a hairdresser), you may wish to display your main website to visitors using one of your self-promoting links and a different website to other viral visitors (your FREE viral traffic Levels 2 - 6), where most of your traffic will come from. By doing this you can provide an offer of more general interest to your non self-promoting link visitors. This can increase your benefits and the profits you can get by creating an additional income stream. One of the easiest options is to use an affiliate offer or CPA offer for the second website. While these can be associated with your primary offer it does not need to be. We suggest your second offer should be of interest to most people. This could be a product or service including business related information. Gender, or age related products are not recommended unless you are displaying a website that provides multiple offers for a wider demographic. To do this create two registrations your main website and a second website linking to your secondary offer (possibly an affiliate offer). On the first (main) registration clear the Display to all your downline levels option in the registration settings for your first offer. With this set up if a visitor visits one of your landing pages via a link to your first (main) website this will be displayed to the visitor during during their registration. However any one that is required to visit your first (main) website from your second to sixth downlines will be shown your second website when they register their website. In general, as most people who register will be looking at promoting their online presence or earning more money by promoting their business or an affiliate program, your second registration could include something of interest to this demographic. Hot tip, On your second website we suggest that where possible you add a banner to your first website. This means that everyone will have the ability to visit your main website if it is of interest. There are thousands or products you can market as an affiliate. In most cases you do not need to do anything more than register as an affiliate and promote your affiliate link. For more information on affiliate marketing visit visit our affiliate marketing programs page, that provides some information for anyone wanting to earm money from affiliate marketing. The key advantage of affiliate marketing using one of the major affiliate marketing sites is that all you need is an Internet connection and computer or other suitable device that you can use to browse the Internet such as a smart phome or tablet. You do not need to hold stock, generate marketing material, invest money in your business (if using free marketing methods), handle refunds etc. With thousands of different devices, numerous browsers and networks, updates are required from time to time. In addition we are continuously adding new features to this website to make it better and provide additional features that will be of benefit to our users. We are currently working on a huge new feature that will not only generate additional traffic but also generate more money for our users. This is a major addition and will take a few months to complete but will be worth the wait. So while we are integrating the new features enjoy generating additional free traffic and get ready to use this to also generate more money shortly. Visit our blog for additional information on updates and fixes. If you have any problems or any errors are reported please contact us. You can edit / control a number of parameters for each registered website on the settings page in the section headed Edit your website information for:-. To view this page log in and hover over / click on the YOUR AREA in the main menu and click on the Settings option from the menu. After making any changes you would like click on the Update site button to update all the changes you have made. A screen shot of the Your website details is shown below where you can edit the website address, the website title, your website description and your website keywords. 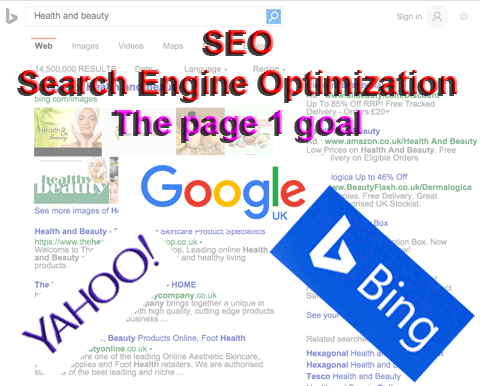 The last 3 of these will help you to improve your search engine optimisation (SEO). Please note changing these parameters does not change your website just the title, description and keywords used when your website page is displayed on this website. Sample screen shot of the Your website details section. Note, no changes will be made until you click on the Update site button. After you have changed your website custom image, title or description you need to test it is used by Facebook. This is because Facebook will continue to use the previous image or text until it re-scrapes your website landing page. 2) Visit your website landing page and copy the link from your browsers address bar and paste into the field to the left of the Debug button (Has the tip Enter a URL to see the information that is used when it is shared on Facebook). 3) Click on the Debug button. 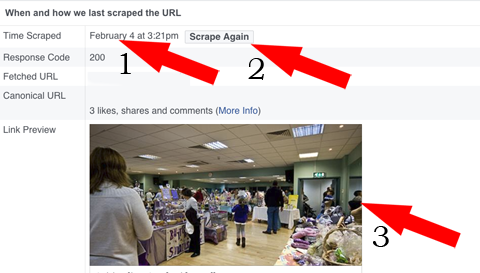 4) Facebook will then display the Time Scraped and information and image Facebook will currently use. 5) If the information or image is not the latest information, click on the Scrape again button. This should re-scrape the web page and show the latest information including the custom image you provided.